Of note, it appears that there are open quotes for occupation for Joseph, Noah and Edward, indicating they worked in the same occupation as their father – coal miner. I can’t imagine that Britain in 1871 was very forward thinking in it’s child labor laws so it’s possible that even as young as 13 they were coal miners as well. 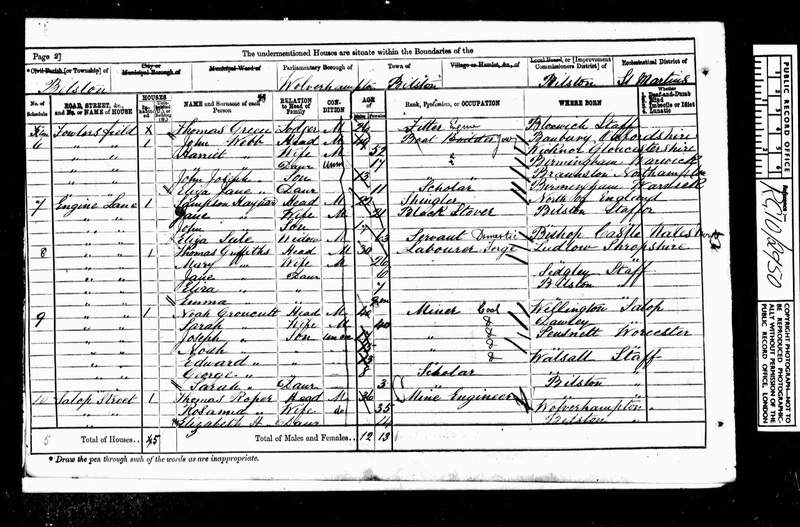 1871 England Census, digital images, Bilston, Wolverhampton, p. 2, household 9, Noah Groucutt household; Ancestry.com (www.ancestry.com : accessed 31 October 2013); citing RG10; Piece: 2950; Folio: 102; Page: 2; GSU roll: 836422.